It's one of my predilections that people do not do evil knowingly. Evil is always construed as some form of doing good. We are always in some kind of delusional state about what our actions mean." The work I am engaged in straddles several genres, it is at once photography, social documentary, and a political commentary concerning out most politically- charged contemporary issue: the institutionalization of incarceration. The prisons represented in my photographs: Alcatraz Island, Eastern State Penitentiary, Jamesville Penitentiary, Montana Territorial Prison, and EIllis Island no longer function as prisons. They are alternatively, gothic ruins, film and photography sets, State and National Parks, museums, tourist attractions, historic sites and condemned structures riddled with toxins. Their relevance to society and their existence as metaphors are intertwined with the ambivalence and confusion that characterizes public opinion about punishment and captivity. 1:20 PM, toned silver gelatin print. The sensibility embraced by these photographs is closest to the sublime: both attractive and repellent, both redemptive and heart-wrenching -- their duality is what makes them compelling to us. They also reflect the ambivalence and nostalgia of the "historic site." Modern historical sites do not commemorate past events, but deflect them. The monument stands in for a patriarchal rendition of history that happily fuses the past with an inert malleable image of itself. The act of looking at the empty prison tells the viewer that barbarity and confinement no longer exist. The lexicon of the grizzled old convict fading into the ghostly walls of the defunct institution assures the tourist that the old prison is a thing of the past. The new institution of incarceration (the High Security Unit) and the new face of incarceration (the young Black or Hispanic man, and increasingly the young woman of color), have no place in this narrative (they are "exnominated" as Roland Barthes put it) and therefore become invisible. 2:15 PM, toned silver gelatin print. By viewing these images consecutively, I believe a visual notebook of the prison as historic monument will result. It is noteworthy that the only access "we" have to prisons are to places which are defunct and, subsequently, viewed in the past tense as sites where historic figures resided, or as the location of past events (like massive immigration and selective deportation). 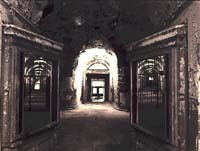 Documents abound of the lives of people affected by such American landmarks as Ellis Island, Eastern State Penitentiary, and Alcatraz Island, but the stories they tell are too often as empty as the facades of the skeletal remains of the penitentiaries. 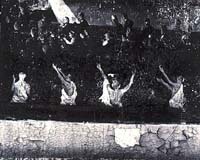 The discriminating nature of recorded history is not unlike the illusion of the crumbling prison. The disparity between the bustle and intrigue of the vast maze used to house maximum-security felons and the dilapidated hush that now permeates those deserted hallways is a reminder of those whose adversities were buried with them (sometimes in the very foundation of the prison). 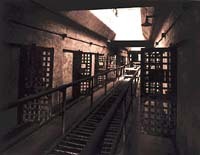 It follows that the psychological effect of the unoccupied prison as a tourist attraction plays a part in our attitude toward modern systems of incarceration. A day trip to the tenantless prison or immigration station is regarded as entertainment, but is also clearly centered around the informing and absorbing a moment of actual "history." The faux piles of "vintage" baggage that line the walls of the great hall at Ellis Island are part homage and part substantiation of the initiation rituals of the immigration experience. At Alcatraz Island State Park -- supposedly "the prison no one ever escaped from" -- stuffed blankets and dust-covered masks still in place these many years serve as reminders of the skill and deception entailed in the one great mysterious escape attempt. One becomes entangled in the narratives and myths of prison life while looking out the barred windows toward San Francisco wondering about the fate of these clever escapees: "Did they make it?" Or were they drowned, their reckless behavior punished in the dark waters of the bay? Here the exploits of filmmaking (Clint Eastwood in Escape from Alcatraz) and actual historical events converge. In either case, the images and narratives evoked from the archaic chambers of these prison sites are littered with nostalgia, even romance. After all, it is the idea of prison that interests us, not the actual place itself. The only prisons we are allowed into, as seen in these photographs, are empty places. We must also question the implications of a society whose fastest growing industries are associated with penal systems. Our entertainment system washes away our guilt as images of prisons provide the public with an immediate visual construct of violence, guilt, retribution, justice, victimization, and punishment. One need only compare contemporary film and television accounts of incarceration with concurrent images of present-day prisons to actualize the thesis that notions of evil and punishment are imagined primarily through entertainment imagery. Perhaps our consistent use of prison in TV and film has constructed the penitentiary as unreal. For the white middle-class viewer, prison is an "impossibility" reserved for the "other" as readily identified in media stereotypes. In any case, prison is another world, one that is constructed to house a permanent subculture perpetually separated from "healthy" society. 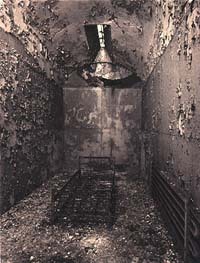 In many ways these photographs of the rotting obsolete prison with its peeling walls, broken windows, and dank mysterious shadows do bear witness to the unspeakable crimes committed within them. 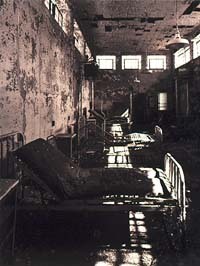 The stories that never surfaced reverberate inside the cells like restless bodies in unmarked graves. 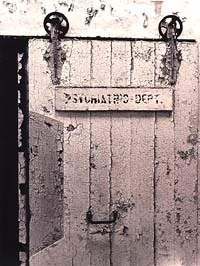 At odds with the tidy sound-bites embossed upon brass plaques that dignify these place as official memorials, these images of discarded prisons are visual embodiments of the gothic nature of captivity, its barbarity, its isolation, its intolerance and basic inhumanity. Margaret Stratton was born in 1953 in Seattle. She received her MFA and MA in art from the University of New Mexico, and has received numerous grants and awards including three regional and two national NEA Fellowships. Stratton works in photography as well as video to explore the cultural politics of race and gender related issues such as incarceration, media stereotypes and icons in contemporary culture. Exhibition venues include The Henry Gallery, Seattle; Camerawork San Francisco; The Houston Center for Photography; Museum of Contemporary Photography, Chicago; The Smithsonian Institution, Washington D.C.; The Harvard Archive, Boston and The Nathan Cummings Foundation New York, as well as at many international film and video festivals. Her critical writing has been published in Afterimage and Camerawork Quarterly, and her photographs and videos are represented in many collections including The Art Institute of Chicago, Seattle Arts Commission, Video Data Bank, Chicago, and the University of New Mexico Museum of Art. Stratton is a professor in the department of art and art history at the University of Iowa.